Dragonflies and Damselflies are a common part of our local wildlife, yet they can be confusing at first glance. 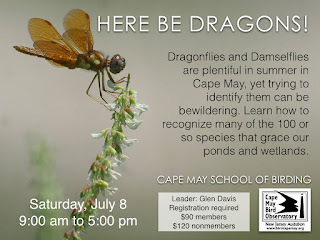 With a mixture of indoor theory and outdoor practice, come and learn how to identify many of the 100 or so species that occur in Cape May County. We'll visit a variety of habitats around Cape May County that will allow us to see a good cross-section of species, from the tiny sprites to the mighty darners. 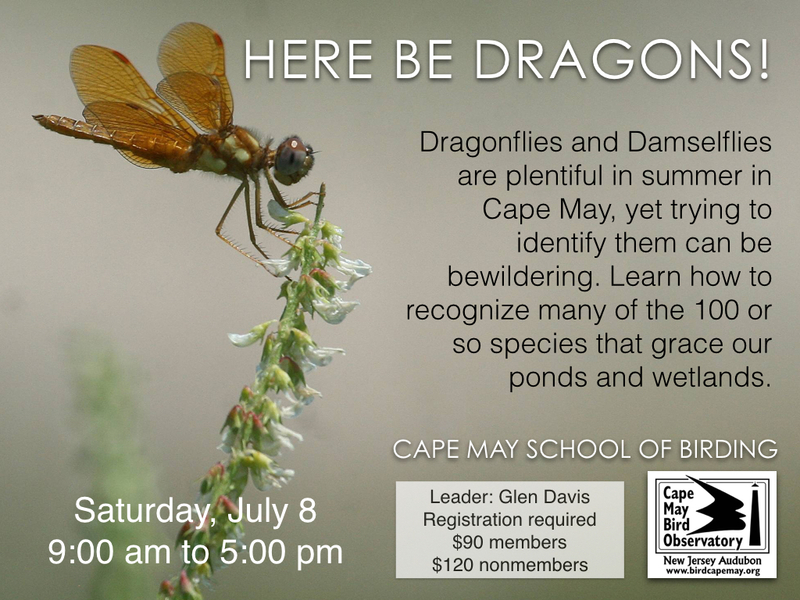 Join Glen Davis on this in-depth School of Birding Workshop and learn to appreciate the incredible beauty and variety of the dragonflies all around us! Saturday, July 8: 9:00 AM - 5:00 PM. Cost: $90 members, $120 non-members. 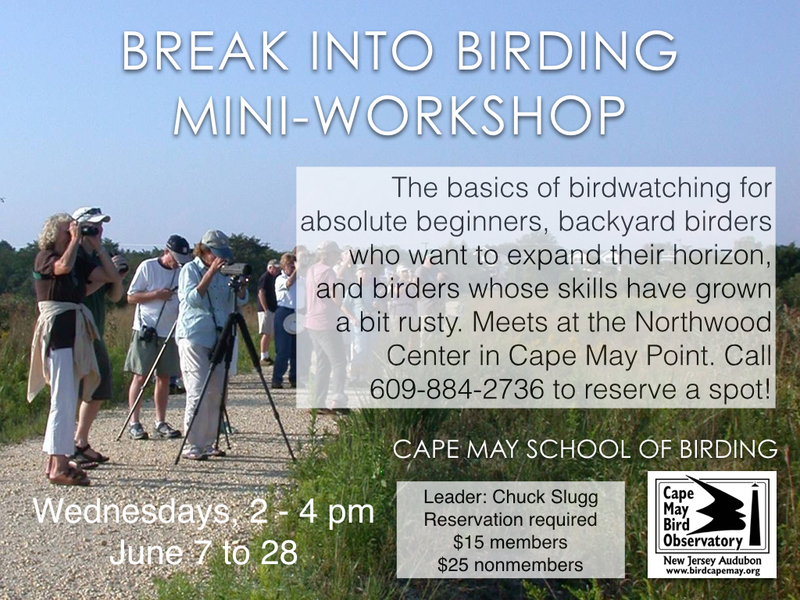 Join us for anther fun afternoon and learn the basics of birdwatching from an enthusiastic expert. You’ll discover how to get the most out of your field guide and optics, and learn where to go to find birds and how to identify them using all the hints and clues birds are offering you. 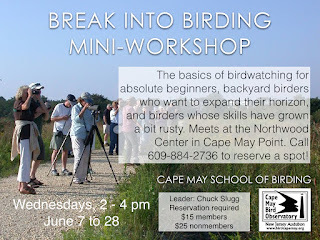 It’s a class for absolute beginners, backyard birders who want to expand their horizon, and birders whose skills have grown a bit rusty. Meet at the Northwood Center in Cape May Point. Numbers limited so please call 609.400.3864 in advance to reserve a place, then pay on the day. Family-friendly (recommended for age 12 and up). 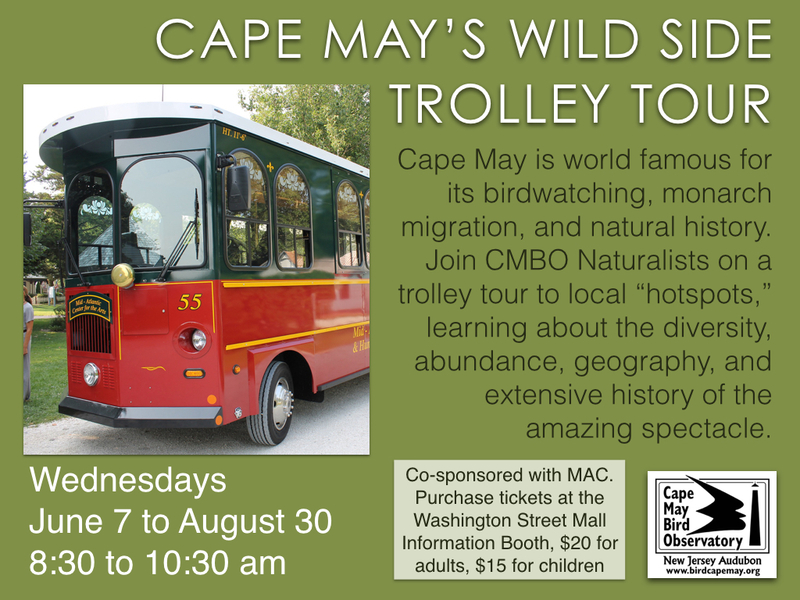 Wednesday was the inaugural Cape May's Wild Side trolley tour and we had a great time. We passed through the best birding places around Cape May, from Higbee Beach to the South Cape May Meadows, including exiting stops at the Hawkwatch Platform in Cape May Point State Park and the Northwood Center - and even enjoyed a Cedar Waxwing nest from the platform. 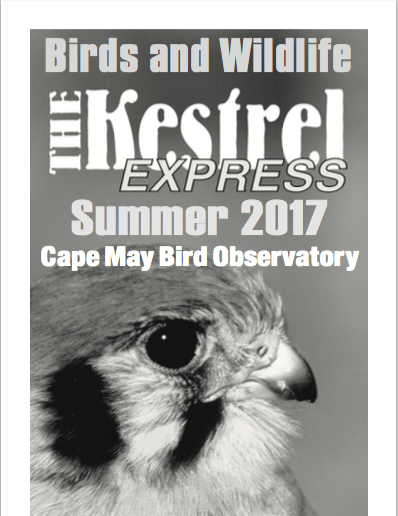 Join our Associate Naturalist next week (or throughout the summer season) for another chance to learn about the phenomenon of migration and the millions of birds and Monarchs that pass through Cape May, little known facts about lands that have been preserved and natural history of the area, and why Cape May is known as the Raptor Capital of North America! This tour, a partnership with the Mid-Atlantic Center for the Arts & Humanities (MAC), will run every Wednesday until October 11 - 8:30-10:30 AM. $20 adults, $15 children (ages 3-12). Tickets may be purchased at the Washington Street Mall Information Booth at Ocean St. or at the Physick Estate. 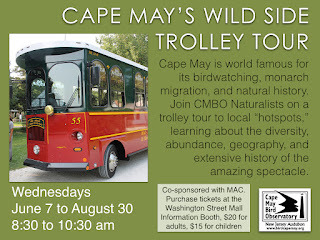 For more information, call (609) 884-5404 or visit www.capemaymac.org. Summertime is when Butterflies and Dragonflies are at their peak, showing flashes of brilliant colors and shapes! Southern New Jersey is fortunate to host a wide variety of each, and is a great area to learn to identify the many species. 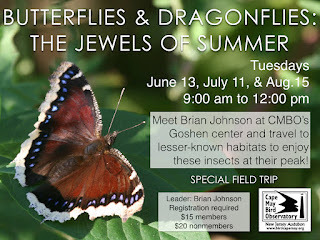 Meet Brian Johnson for this Special Field Trip at CMBO’s Center for Research and Education on Rt. 47, mile marker 15.8 in Goshen. We will travel from there to locations to be determined, including some lesser-known habitats looking mostly for Butterflies. We will also spending some time enjoying Dragonflies and Damselflies. 9:00 - 12:00 PM. $15 member, $20 non-members. The Summer Kestrel Express is online here. Printed copies will be available soon!